Javier castle is a treasure of the Jesuits, which keeps priceless works of art. This amazing palace was built on a natural hill in the middle of a small village with the same name, which is located in the Spanish Basque region. 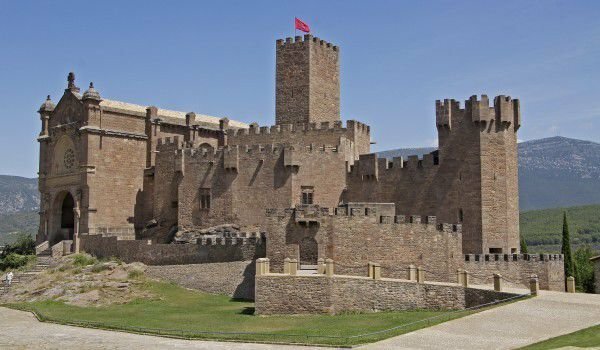 This medieval fortress is situated in northern Spain, in the province and autonomous region of Navarre. The castle stands at about 30 km from Pamplona. The history of Javier castle began in the 10th century, when on the rocky hill first built their fortress Arabs, but to date has failed to keep almost nothing in this early design. Javier castle has a dual function to protect the borders, and to serve as noble residence. Later castle Javier became a significant place of worship, because here on April 7, 1506 was born Saint Francis Javier. Saint Francis is a founding member of the Order of Jesuits, is celebrated as the patron saint of Navarre and missionary church. From the Middle Ages until today Javier is a sacred place for believers. Through the region passes the famous pilgrimage route Jacobea, which is filled with people of all ages and parts of the country in March each year. After the construction of the central palace in the 10 century castle Javier began to expand in 12 and 13 century, acquiring a semi-circular shape with 2 side towers in the 11th century. Until the early 16th century Javier was finalized with trenches and walls. The castle was partially destroyed in 1516 - an action that was ordered by Cardinal Cisneros to continuous uprisings, which were organized here. The castle is owned by the father of St. Francis Javier in the 16 century. Javier castle is one of the few in Spain, which have managed to retain such integrity - almost intact are the portal and protective structures. The castle is entered through the main gate, on whose wall hangs the emblem of the family of Javier. In the courtyard you can see buildings which are used as prisons. Particularly interesting is the chapel of Santo Cristo, in which one can see beautiful carvings and murals. Impressed wood carvings depict Christ on the ceiling. According to legend, it bled the day on which St. Francis died. The walls of the chapel of Javier castle keep beautiful murals, called "Dance of Death" which has no analogue in Spain and is an especially valuable artwork. Still invaluable is the altar 16 centuries, made of alabaster and colorful which is part of the "Adoration of the Magi. In this part of the castle Javier can be seen up to 6 large paintings, works of Baroque art, created by Godofredo Maes. Sculpture of Francisco Javier is dated around 1622, the year of the canonization of the saint. In 1986 the Javier castle has turned into a museum after major archaeological restoration work. Currently, Javier is available for public visits against an entrance fee of 1-2 euros. In the Chaplain's Room is located a permanent exhibition of religious art, historical documents and objects collected over the centuries and the story of the castle. In this part of the Javier castle can be seen even a collection of Japanese kimonos, collected in 14 century.